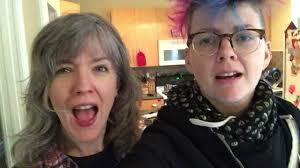 SUSAN ELIA MACNEAL: Writer, blogger, and now podcaster Alice Bradley seems to have gotten inside my head. I'm half-way through THE PARIS SPY and am at that frustrating awful horrible point where nothing is working and I'm starting to panic. I think of it as my old friend, anxiety, but Alice calls it the Nameless, Formless Dread, which perhaps makes it a little less terrifying. ALICE BRADLEY: Looking over list of tasks for the day, Alice hears a disembodied voice*.
? : Ha ha, you’re not going to accomplish any of it. Again.
? : Good morning. I am The Nameless, Formless Dread! Me: I need to cut down on my coffee. Me: Huh. Did I eat something weird? NFD: Hello. I am the Nameless, Formless Dread. Me: Jesus—get off me! I’m trying to work. NFD: I will help. That thing you’re doing is bad. Me: How is this a help? NFD: How about this? That thing you’re doing is very bad. Me: Please unhook yourself from my abdomen. NFD: But it’s so soft here. (whispers) Too soft. NFD: Nameless, Formless Dread, here! Ouch. That was awkward. Boy do they not like you. Me: That’s ridiculous. Why would they dislike me? NFD: (Shrugs) They have very good reasons that they’ve all agreed on but you’ll never know what those are. NFD: Someone is dead! Or mad at you! Me (looking at number): It’s a telemarketer. NFD: Why don’t your friends call? Oh, because you’re… never mind. NFD: Hey there, Nameless/Formless Dread, blah blah, hello, are you getting up? Where are you going? Me: I have a thing I’m supposed to go to. NFD: No way. Do you know how many things could happen to you out there? And why are you wearing that? Look, I brought kettle corn! Me: This kettle corn is stale. NFD: That's an early warning sign of dementia, you know. Thinking, uh, things are stale. I haven't thought this through yet. But don't worry, I will. NFD (clambering atop my head): Oh no, oh no! You forgot! YOU FORGOT! NFD: … I can’t remember. Huh. Well, at least now you have all night to figure it out. SUSAN ELIA MACNEAL: Does the NFD come to you, too, when you're working on something? Trying to sleep? What do you do? P.S. And does anyone else now want kettle corn? I'm a writer, and I live in Brooklyn, New York, with my husband Scott, my son Henry, my dog Hazel, and Izzy the cat. 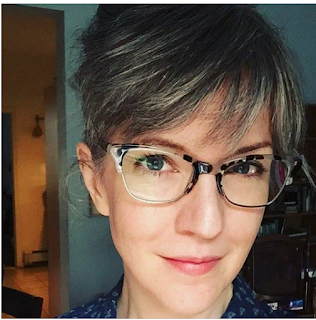 I write short fiction, personal essays, humor, and feature articles. I've created content for all kinds of publications and brands. Here's a selection of my work. I've been writing Finslippy since 2004 (back when I thought I could call it a nonsense word I came up with in my dreams, since no one was going to read it). In the beginning I wrote about parenting, but these days I blog about creativity, art, mental health, our surly cat and hilarious dog, and whatever is going in my life. 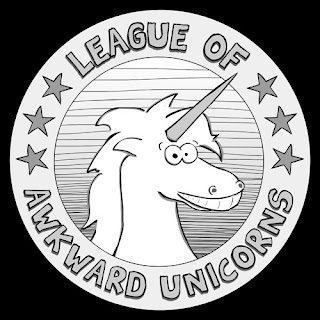 I've got a podcast with Deanna Zandt called The League of Awkward Unicorns, It's about mental illness (depression, anxiety, etc. etc.) and emotional wellness (things that help, whether it's medication, exercise, or wrapping oneself up in a Snuggie while binge-watching The Mindy Project). We were called "funny, frank, and accessible" by the Guardian. 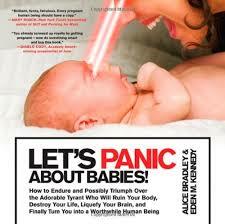 I co-authored a book called LET'S PANIC ABOUT BABIES! with the beloved Eden Marriott Kennedy. It was published by St. Martin's Press, and we're quite proud of it. You can read all about the book (and enjoy our book trailer, excerpts, and reviews) over here. I'm also a teacher for Gotham Writers Workshop, and often teach online courses in writing and creativity via this very website. Want to be the first to know about upcoming courses? Sign up for the newsletter! As of June of 2016, I am officially, unapologetically, calling myself an artist. Want to see my work? For now, it's mostly on Instagram. "I usually find things amusing online, but don't always laugh, like with my voice. Today I did." Oh, dear, I can imagine how frustrating it must be to reach a difficult point in your writing . . . here’s hoping you’re past that particular bump in the road very soon. As for as visits from the Nameless, Formless Dread are concerned . . . sad to say, they seem to occur with amazing regularity and I confess I don’t do much about it except to fret a great deal and heave a sigh of relief when, despite that Nameless, Formless Dread, it all turns out well. Alice, have you been hiding out in my head (abdomen?) NFD is my best friend. It's the voice that's whispering insults as I revise my novel. It's a writer's best friend and worst enemy. One. Don't relax just yet." NFD sometimes comes to me as I am trying to sleep and asks " are you sure you paid the electric bill? Don't you have a dentist appointment tomorrow after work? Why did you make plans with friends? They probably have better things to do anyway. Should you have bought that birthday card for X? Her birthday isn't until next month . What if something happens to her? She didn't look so good last week. You probably already wrote a message inside the card, didn't you?" NFD always shows up--on a good day, I'll tell it 'Hello, back again, huh?' and keep on doing what I was doing. On a really bad day, I'll tell it to 'Shut the f--- up!' and then keep on doing what I was doing. The trick, for me, is simply to acknowledge that it's there. I answer the NFD by talking out loud to myself. Usually, that enables me to talk down the NFD and talk up my own more sensible and realistic voice. Regardless of what the topic is, I want to believe that my fears are baseless and my capacity to face and to survive is boundless. Come on, women: Let's be the courageous heroines of our own lives! I either go for a walk or ride my bike every day. If that doesn't take care of it, a nap. Anxiety does not improve my work product; and I learned working in an office that the photocopier can feel it and will screw with me if I'm on a deadline. So I finish everything at least 2 days early. Word to the wise. I cannot begin to tell you how grateful I am. I don't mean to be weird about it, and not to go overboard, but this is the most perfect timing of any blog I've ever read in my entire life. Today, driving home from somewhere I said to my husband: there's no way. There's no way I can do this, and I might just give up. Jonathan says : just so you know honey, you always say that. I know, I said, but this could be the time it's true. He said: you always say that, too. And really, I'd love to know what is the deal is about this-- why do we all have this? or is it we all? And Keenan you are right, the machines know . So, Amanda, I am going to read your comment a couple hundred more times . So wonderful to read this this morning! Keenan, yes! The machines sense fear! I think NFD has a cousin - IWS (Insecure Writer Syndrome). I'm suffering from it now. I'm working on a new book and thinking, "I'm not sure I can pull this one off. I may have blown everything I had on the last book. And by the way, WHY did I query that Top Agent? Even though she said I had great writing, I'm sure I'm going to mess it up somehow." Right on, Hank! You can do it, you really can. Turn a deaf ear to those wretched voices. Look in the mirror and...just keep going! That's half the battle, isn't it? To just keep going? Even if we have to scrap a few thousand words along the way, getting the momentum going and KEEPING IT GOING does, eventually, get us where we need to get. All the best, Hank. I believe in you! And just for the record: I hate, loathe and fear the dark. I don't like it outside much and I really don't like the dark basement when I'm home alone (and I'm 56, for goodness sake). But I've learned to take the big flash light and shine it into all the corners, ready to bonk the boogey man on the head if I need to. Not facing that fear and not checking out the dark corners myself just makes the fear grow in my mind. If someone is there, well, not checking it out won't change that; and if nobody is there, well, then it's all good. Oh that rotten NFD. It has been stalking me for as long as I can remember. Happily I am at the point in life where I can ignore it and just say to hell with it. Bleah. Bleah is so perfect, Pat D! Oh Alice, I think this must resonate with all writers! Every book I write I'm in panic mode for the first fifty pages. This plot dill never work. This idea is rubbish. I'll say everything I can say in eighty pages. My editor will hate it. My fans will hate it. I'll never make a bestseller list again. I have to get through this EVERY SINGLE BOOK. And while I'm writing the lying awake worrying too. Alice, writers and readers have that Nameless, Formless Dread in common. As a reader and reading blogger, that voice of NFD talks to me daily, telling me that my TBR list and the stacks of books awaiting me are never going to get read. This is especially true with Bouchercon rushing towards us. At the beginning of the year I made out a list of authors whom I hadn't read whom I want to read by the next Bouchercon, being this quickly approaching September. Of course, I didn't know that my husband was going to have a major accident or that I would have gall bladder problems and surgery, so the NFD became quite the insidious companion. Even though I've achieved some success with my Bouchercon reading list, I do realize that I won't be able to complete it by any stretch of the imagination. I am a little less panicked by NFD at this point and am close to Pat's point of saying "to hell with it." Of course, there is the simultaneous problem I have of ADD, where I am reading an author I've meant to get to and can't quit reading his/her series. Enough Charles Todd. I have other books I must read. I'm easily distracted, too, by the new shiny book that arrives in the mail. You sound so entertaining, Alice, that I'm looking forward to checking out your many places of appearance. Thanks for the post today that helped me name my affliction. I love the visualization of Muppet critters wearing NFD labels being picketed with angelic Muppets carrying stop signs. The whole I want to do, am afraid to do, oh heck just do it conversation has dogged me forever. I never thought the best of the best would still be having these inner dialogues as well. Thank you for your candor. Thank you so much, everyone! I'm glad my NFD resonated with you all. I find giving the dread a name and a form helps a great deal. My NFD's real name is Craig. He has terrible posture and wears a Members Only jacket, unironically. Reminds me of the conversations between two famous people in the Style section of the Sunday New York Times.